This is the first entry of the JWST MIRI and NIRSpec integration and test journal. This series of articles will provide a behind-the-scenes look at how the Mid-Infrared Instrument (MIRI; provided by a consortium of European institutes in a partnership with JPL) and the Near-Infrared Spectrograph (NIRSpec; provided by ESA), are being prepared for launch and operation in space. We start this series by catching up with the main events following delivery of MIRI to NASA's Goddard Space Flight Center (GSFC). MIRI arrived at GSFC on 28 May 2012, having been despatched from the Rutherford Appleton Laboratory in the United Kingdom, where it had been assembled. Engineers from ESA, the MIRI European Consortium and NASA were on hand to take delivery of this, the first of JWST's four instruments to arrive at GSFC. After unpacking, MIRI was installed in the Space Systems Development and Integration Facility (SSDIF) - the largest 'class 10,000' cleanroom facility in the world - where it underwent a series of tests and inspections. These post-shipment functional tests verified that the interfaces and equipment were all working correctly and the optical metrology test checked the integrity of the instrument alignment after transport. Above: The Space Systems Development and Integration Facility cleanroom at NASA GSFC. Right: Inspection of the MIRI flight instrument after its delivery at GSFC. Having passed these first tests the next step was to prepare for integrating MIRI to the JWST payload module - the Integrated Science Instrument Module (ISIM) - by carrying out electrical checkouts of the combined MIRI and ISIM system; this was completed in November 2012. The ISIM is the composite structure that supports JWST's four science instruments - MIRI, the Near-Infrared Camera (NIRCam), the Near-Infrared Spectrograph (NIRSpec), and the Fine Guidance Sensor /Near InfraRed Imager and Slitless Spectrograph (FGS/NIRISS). In March 2013, the FGS/NIRISS was the first instrument to be installed on the ISIM. This was followed by MIRI, on 29 April 2013. Manoeuvring MIRI towards ISIM. Credit: NASA/Goddard Space Flight Center/Chris Gunn. Integration of MIRI into ISIM. Credit: NASA/Goddard Space Flight Center/Chris Gunn. A thermal shield, designed to protect the MIRI instrument from excess heat, was installed around MIRI. Once in orbit, MIRI will study mid-infrared light from very faint distant astronomical objects. To achieve that, the instrument and its state-of-the-art detectors will be cooled to 7 Kelvin (-266 °C) by a unique "cryo-cooler" system and will need to be shielded from the heat of the slightly warmer (40 Kelvin, -233 °C) ISIM structure. MIRI integrated with ISIM showing the thermal heat shield. Credit: NASA/Goddard Space Flight Center/Chris Gunn. The ISIM, with the two instruments (MIRI and FGS/NIRISS), is now being prepared for the first series of cryogenic tests, planned for later this summer. These will include optical, electrical and electromagnetic interference tests, all under cold vacuum conditions. The tests will be conducted in the Space Environment Simulator (SES) vacuum chamber at GSFC. The full test assembly of the flight payload and the associated ground test equipment is nearly 8m across and 10m tall. It will take about three weeks for the assembly to reach a stable operating temperature of between 35K to 40K, an environment mimicking the conditions that the JWST science payload will experience in space. Some of the MIRI integration team at Goddard. Credit: NASA/Goddard Space Flight Center/Chris Gunn. These first tests serve a number of purposes: they allow the engineers to check the performance of the various thermal control and contamination avoidance systems involved in cooling the ISIM hardware to the required flight-like temperatures; to operate the ISIM systems and instruments together in the flight-like cryo-vacuum environment; to perform an initial optical checkout of the MIRI and FGS/NIRISS when they are mounted on ISIM; and to carry out some important instrument-level health checks. At a later stage, when all four instruments and systems are installed on the ISIM, the formal verification programme will be carried out in two series of cryo-vacuum tests. 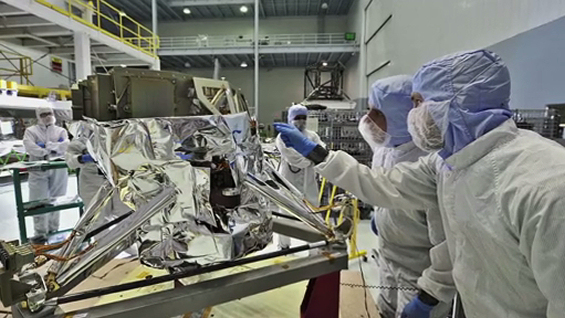 The Mid-Infrared Instrument (MIRI) is one of four instruments on JWST. MIRI will provide direct imaging, medium- and low-resolution spectroscopy, and coronagraphic imaging. It is expected to make important contributions in all of the primary science aims of JWST. MIRI was developed as a partnership between Europe and the USA - the main partners are a consortium of nationally funded European institutes (the MIRI European Consortium), the Jet Propulsion Laboratory (JPL), ESA, and NASA's Goddard Space Flight Center (GSFC).